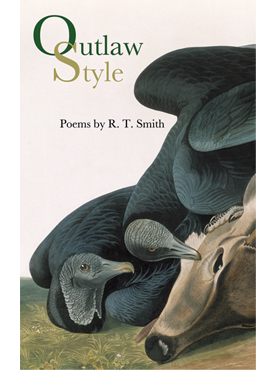 Outlaw Style is a collection of narrative and lyric poems, many of them in the tradition of Robert Browning’s dramatic monologues. While gothic imagery, humor, and nineteenth-century diction and reference alternate and interweave, the four thematic currents that converge in the collection are music, race, spirituality, and the impact of monstrosity on somewhat innocent bystanders. Poems like “Dar He,” “Scuppernongs,” and “Plantation of the Mad” address the history of American racial intolerance with muted horror, while the final series of poems explores the roots and impact of traditional music, from unsettling songs of the Carter Family through Delta Blues and the haunting ballad “Strange Fruit.” The collection also features poems, such as “Shepherd Ollie Strawbridge on the Chicken Business,” which question the nature of spirituality; and the central section, “The Booth Prism,” performs a kind of séance in which the author channels the voices of many of the people—from Anna Surratt Tonry to Booth’s lovers and siblings—whose lives were altered by contact with Lincoln’s assassin. Throughout Outlaw Style formal and vernacular rhythms stand in counterpoint, images of violence excavate a stark and troubling beauty, and history and mystery fuse and feud, as the landscape and culture of the American South are presented for interrogation and understanding. R. T. Smith is the editor of the journal Shenandoah at Washington and Lee University. He is the author of a number of books, most recently, Uke Rivers Delivers: Stories; The Hollow Log Lounge: Poems; and Messenger, winner of the Library of Virginia’s Literary Award for Poetry. Among his other awards are the Cohen Prize for Poetry, the Guy Owen Prize, and three Pushcart Prizes.